Choosing a suitable container is key. At the top end are bespoke jewellery trays (felt covered, multi-compartment inserts that are custom sized to fit your drawers), but most of us will probably need to be a bit more DIY – as well as storage containers (like this), recycled tea cups and wine glasses make great places to sort and store earrings. A small storage box from the hardware shop can be useful too, especially as they have many compartments. Other things to consider: empty tic tac containers, small jars, egg cups, pill sorting containers, fishing hook boxes (craft shops are another great place to scout for containers). 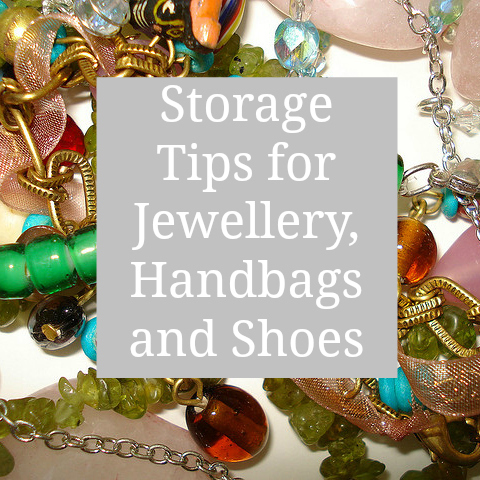 Make sure to clean your jewellery before storing – hair spray, perfume and perspiration may damage or cause your gold, silver or metal items to dull. To prevent kinks, necklaces should lay flat and straight if not hung during storage (Tip: string a pearl necklace across your dresser to hang earrings across). Sterling silver jewellery tends to tarnish easily – store it in an airtight container or zip lock bag to prevent this happening (you can also use anti-tarnish strips or silica gel). If you keep jewellery in your purse or handbag, use a zip lock or drawstring bag for protection, or purchase a small travel jewellery roll. Finally, store a small number of frequently used items separately from the rest in a special container. This will help at the start or the end of the day, or if you remove your jewellery during housework. One of the best ways to store handbags is to put them in plastic boxes to allow air to circulate. Just make sure the boxes are big enough so that you don’t fold over the bag handles. The handbags you use regularly need to be easily accessible, so store them on the top or side shelf in your closet, standing upright in a line. You can organise them by size, type or colour. Purses you don’t use often can be wrapped in cotton pillowcases or cloth bags before putting them into storage. Do not put them in enclosed plastic dry cleaning bags, or boxes without airflow as this will damage the leather. If storing bags together, make sure you cover any brass or mental chains, rings and studs to stop them marking other bags. You can do this with a piece of tissue or cloth. Tuck chain handles inside the bag to prevent the chain from scratching or marking the outside leather. Undo metal fastenings and buckles on straps so that they don’t leave an impression. To help them keep their shape, stuff the bags with tissue paper or any alternative acid-free filling, but do not use old newspapers. Bubble wrap is better than tissue paper for padding out or wrapping bags, as it doesn’t attract moths in the same way as tissue paper. Storage boxes are great for shoes you don’t wear often or are off-season. Plastic see-through boxes that stack are recommended – or use the original box and attach a photo on the outside for easy viewing. Shoe racks and shelves made from wood are great for shoes that you wear frequently and can be stored in closets with space beneath the clothes rod. Many racks and shelves stack so you can add multiple levels for additional storage without having to use horizontal space. Placing shoes that you don’t wear frequently under your bed might be a good idea too (especially if your wardrobe is already crowded). Specially made storage containers have individual shoe compartments and often wheel out. High traffic areas can benefit from storage benches or baskets to help organise shoes and reduce clutter. Drew writes for Big Yellow Self Storage. Big Yellow provides secure do-it-yourself storage rooms and wardrobe sized storage lockers for as long or as short a time as you need. For more tips, see their blog. Whatever you are storing. If you are using a storage company there are several things to consider. Firstly how secure is the storage? What security measures do they have in place and finally is everything insured when you are in storage?